1. ACTIVATE the yeast. The water should be between 95-100°F, or comfortably warm to the inside of the wrist. Add two good pinches of sugar and stir to dissolve prior to adding the yeast granules. Swirl the sweetened water, and sprinkle the yeast on top while the water is still moving. Allow to sit for 5-7 minutes or until the top is nicely foamy and the yeast awakened. 2. MEASURE the flour and place in a large mixing bowl. 4. COMBINE both wet mixtures (the foaming yeast and the warmed milk) into the flour, and stir until all of the flour has been incorporated. 5. 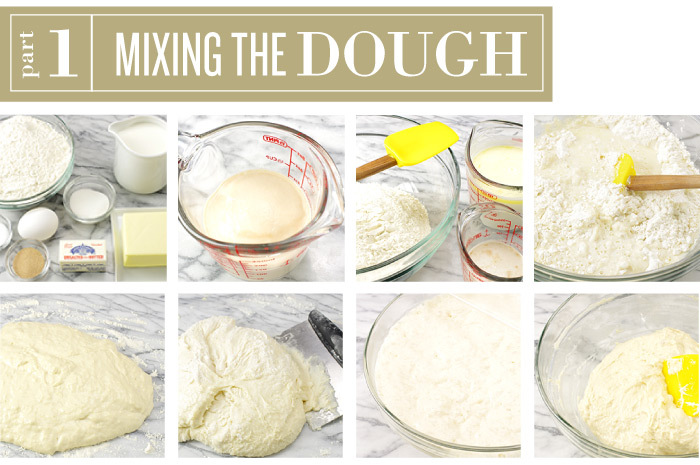 TRANSFER the rough, wet dough onto a working surface (marble pastry slab or countertop). 6. KNEAD the dough lightly just until the dough holds together. Do not over-knead. A bench scraper is very useful in scooping up the dough and folding it over on itself. 7. PLACE the dough in a clean, large mixing bowl for its first rising session. Cover and allow the dough to rise in a warm environment until tripled in size. This may take 3-4 hours depending on the ambient temperatures. 8. DEFLATE the dough and lightly knead the dough in the bowl. Cover and allow the dough to rise a second time until doubled in size, about 1 – 1-1/2 hours. The second rise may be accomplished overnight in the refrigerator. 9. PREP a layer of butter by slicing chilled butter into 1/4-inch slices. On a sheet of parchment paper or wax paper, draw a rectangle with a ruler and pencil 7 x 15 inches in size. Turn the paper over placing the drawn side next to the working surface. Arrange the butter slices tightly together within the bounds of the drawn rectangle. Cover with a second layer of parchment paper or wax paper, and with a rolling pin, roll the butter to meld the pieces together and form the desired size. The butter slab should now be 7 x 15 inches in size. Chill in the refrigerator. 10. 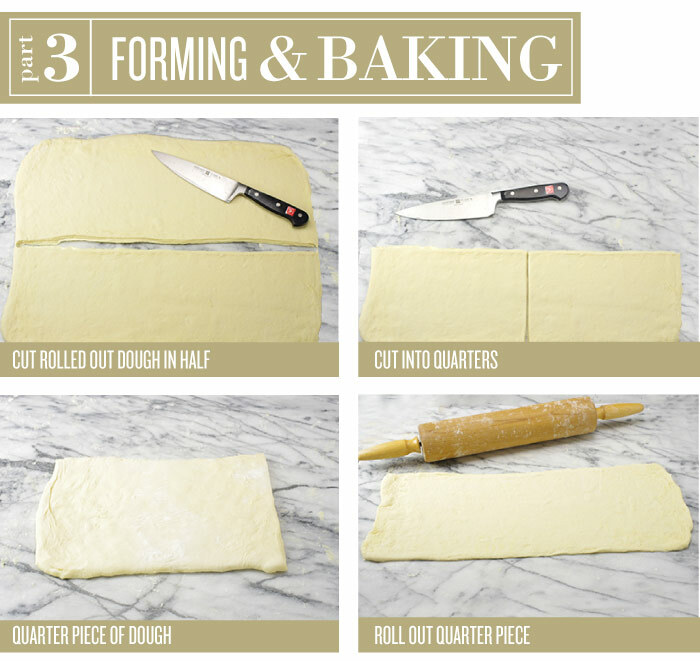 TURN the dough onto a working surface and form into a rectangle approximately 8 x 24 inches in size. Use a light dusting on the working surface and on your hands as you push and roll the dough. 11. PLACE the formed butter slab on the right side of the formed dough rectangle. The butter should cover approximately two-thirds of the dough with a half-inch margin of dough surrounding the butter. 12. 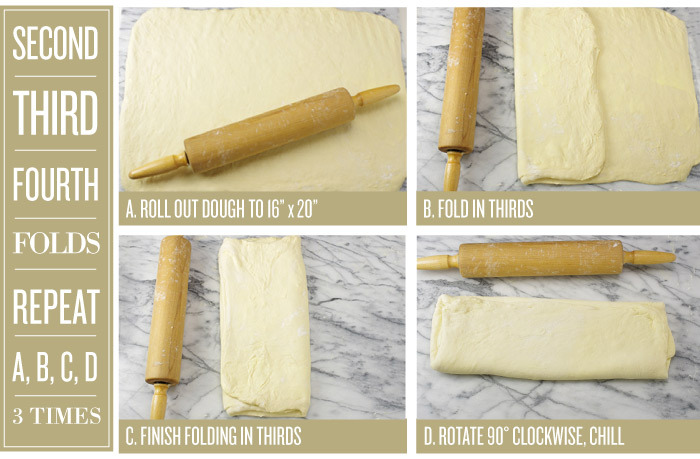 FOLD the dough in thirds by first folding the left-hand third (just dough) over on top of half the butter. 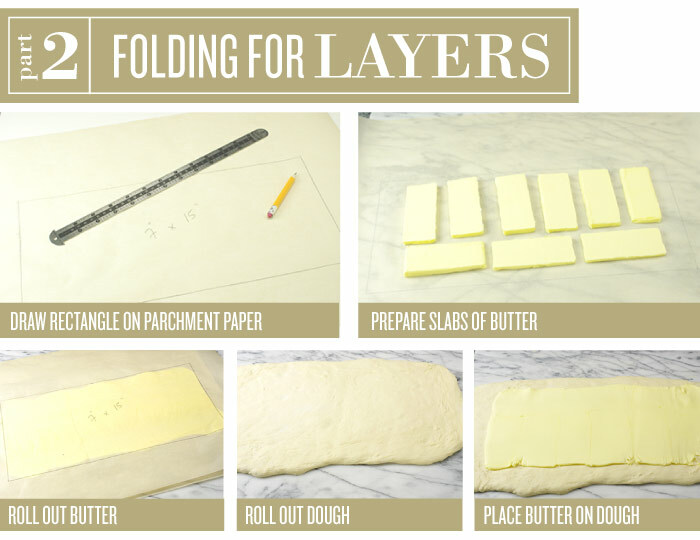 FOLLOW by folding the right-hand side (butter and dough) over the two dough layers. TURN the dough a quarter turn (90 degrees) clockwise so that the open edge and the longer length of the dough extends left to right. 13. ROLL the newly formed rectangle into a larger rectangle, approximately 16 x 20 inches. Lightly dust as necessary during the rolling process. Repeat the folding by thirds process, left side over the middle, right-side on top of the left and middle. TURN the dough a quarter turn (90 degrees) clockwise so that the open edge and the longer length of the dough extends left to right. CHILL the dough in the freezer for about 15-20 minutes or until well-chilled once more. 14. REMOVE the dough from the freezer and allow to acclimate for 5-7 minutes. ROLL the dough again into a rectangle 16 x 20 inches. FOLD as before, left over middle, right over middle. TURN the dough a clockwise quarter turn as before. 15. ROLL once again into a rectangle, 16 x 20 inches. FOLD as before, left over middle, right over middle. Wrap the dough well and chill for 1-2 hours or overnight. 16. REMOVE the well-chilled dough from the refrigerator and ROLL out into a rectangle, 16 x 20 inches. Cut the rectangle in quarters. Working with one quarter of the dough at a time, roll each quarter into a long rectangle, 5 x 15 inches. (Chill the other pieces while working each dough quarter). 17. CUT each rectangle into 8 triangles trimming the left and right sides. 18. LENGTHEN and stretch each triangle by rolling it until it is about 8 inches in length. PLACE half a slice of ham on each triangle followed by a slice of cheese. 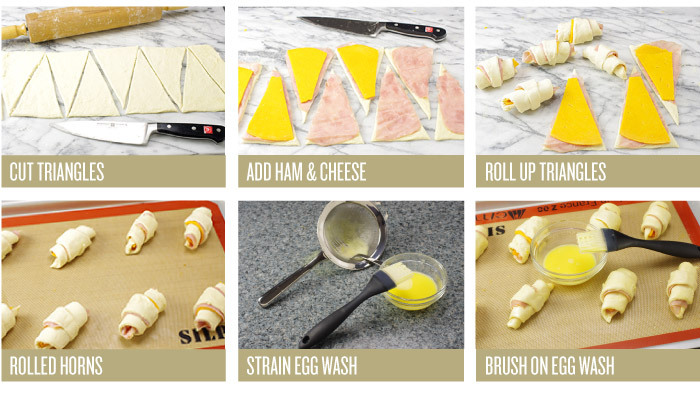 TRIM the ham and cheese so that they roughly fit the dough without too much excess extending beyond the edges of the dough. 19. ROLL the triangle, beginning at the wide end. Place the rolled dough on a baking sheet lined with a baking mat or parchment paper with the point of the dough just on the underneath side of the rolled dough. Leave a generous amount of space between croissants; they will expand during rising and baking. Repeat with the remaining dough using additional baking sheets. 20. COVER the formed croissants carefully with plastic wrap and allow the bundles to rise until nearly tripled in size, about 1-1/2 – 2 hours. 21. 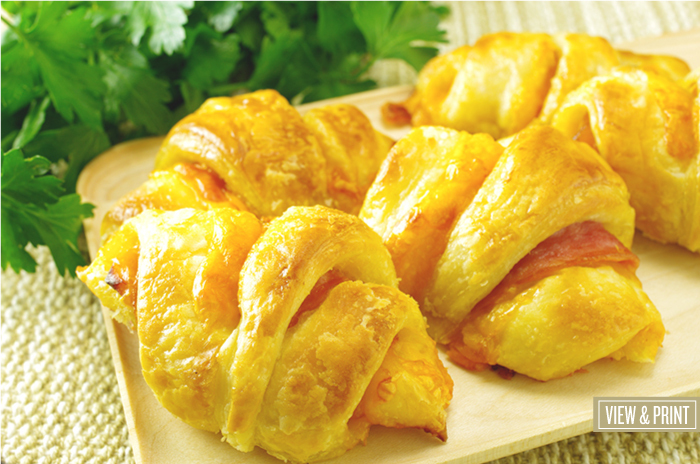 APPLY an egg wash, (1 egg beaten with 1 tablespoon water), gently to the surfaces of the croissants just prior to baking. This will lend a nicely glazed surface to the baked croissants. 22. BAKE in a preheated 400°F oven for 15 - 17 minutes or until nicely browned. Cool on a baking rack. Serve while still warm. and Fine Cooking, Issue 97 by Jeffrey Hamelman.